Provides fast and efficient data protection for all of your virtual machines, even those powered off or migrated between ESX hosts. Significantly reduces disk space consumed by backup data using patented variable-length deduplication across all backups. Reduces the cost of backing up virtual machines and minimizes the backup window using Change Block Tracking (CBT) and VMware virtual machine snapshots. Allows for easy backups without the need for third-party agents installed in each virtual machine. Uses a simple, straight-forward installation as anintegrated component within vSphere, which is managed by a web portal. 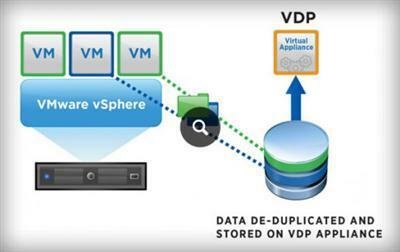 Provides direct access to VDP configuration integrated into the vSphere Web Client. Protects backups with checkpoint and rollback mechanisms. Provides simplified recovery of Windows and Linux files with end-user initiated file level recoveries from a web-based interface.